180 pages | 36 B/W Illus. Its scale, flexibility, cost effectiveness, and fast turnaround are just a few reasons why crowdsourced testing has received so much attention lately. While there are a few online resources that explain what crowdsourced testing is all about, there’s been a need for a book that covers best practices, case studies, and the future of this technique. Filling this need, Leveraging the Wisdom of the Crowd in Software Testing shows you how to leverage the wisdom of the crowd in your software testing process. Its comprehensive coverage includes the history of crowdsourcing and crowdsourced testing, implementation practices, and future trends. The book discusses best practices in implementation—explaining what, when, and how to crowdsource in a testing effort. It also includes case studies that illustrate how both product and service companies have successfully applied crowdsourcing in their testing programs. Explaining how to use the combined advantages of crowdsourcing and cloud computing for software testing, the book examines various engagement models in which you could implement crowdsourced testing. It addresses effective defect management in crowdsourced testing and considers both the business and engineering aspects of crowdsourced testing. 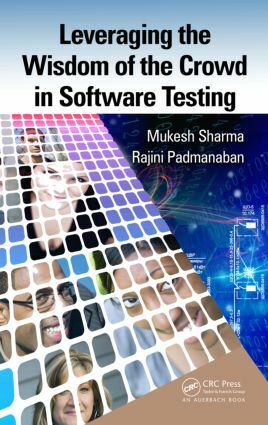 The book explores the challenges, limitations, and situations when crowdsourced testing will not work and provides powerful best practices for mitigating the constraints and challenges, including how to build a crowdsourcing platform to test software products. Covering career opportunities for crowd testers, the book concludes by taking a look at the need to build a crowdsourced testing ecosystem, who the players of such an ecosystem would be, and who would need to champion such an effort. This book is unique in explaining how to combine the power of crowdsourcing with the craft of software testing to share practical experience, lessons learned, and provide guidance for others to hit the ground running. The rich set of examples provided here help set the context for all practitioners to help improve understanding of a fast-moving field. The depth of experience comes through with guidance on how to build a platform, create an ecosystem, and avoid the many potential problems and pitfalls that present a threat to successful crowdsource testing initiatives. The Did-you-Know conclusion offers pragmatic suggestions and offers a synopsis of advice to move forward on crowdsourced testing. Quality is an amorphous, ephemeral condition, especially in software—and very hard to achieve in an increasingly online and mobile world. High quality requires meeting the needs and requirements of a broad and diverse set of people—and to do so requires a diverse set of analysts—a crowd—to help ensure everyone’s needs are met. This book offers a formula for helping everyone become successful in leveraging the crowd to improve the quality of the software experience. What Are the Traits of the Crowd That Make It Relevant to Be Engaged in Various Stages of Product Development? Is Crowdsourcing the Same as Outsourcing? What Is Crowdsourced Testing and Where Does It Fit in This Picture? Why Leverage the Crowd for Software Testing? Are You Ready to Stand Out in a Crowd? Is Crowdsourced Testing a No-Brainer Solution to All Quality Problems? When Do We Crowdsource Our Testing Effort? What Do We Crowdsource in Our Testing Effort? How Do We Crowdsource Our Testing Effort? What Are Some Core Challenges in Defect Management in a Product Team? Is Defect Management Any Different in a Crowdsourced Test Effort? What Can Go Wrong If Defect Management Is Not Effective Specific to Crowdsourced Testing? Can I Leverage Best Practices in Defect Management from a Formal Testing Effort in My Crowdsourced Testing? Are Defect Tracking and Measurement Important in Crowdsourced Testing Too? Are There Any Case Studies to Help Understand Crowdsourced Testing Defect Management in Real Time? Chapter 3: Why Leverage the Crowd for Software Testing? Chapter 4: Is Crowdsourced Testing a No-Brainer Solution to All Quality Problems? Is Crowdsourced Testing a Viable Career to Build? Who Can Become a Crowdsourced Tester? What Should I Do to Prepare and Be Successful in Crowdsourced Testing Assignments? Who Is Responsible for Building This Ecosystem? As founder and CEO, Sharma Mukesh started QA InfoTech with a vision to provide unbiased Quality Assurance solutions for business partners worldwide. Responsible for the company’s global operations, marketing, sales, and development efforts, QA InfoTech, under Mukesh’s leadership, has grown to five Centers of Excellence with over 700 employees. Mukesh is an active test evangelist, spreading the word on software testing through articles, conferences, and most recently his book on a career in testing. Through his passion for excellence, keen eye for detail, and customer commitment, QA InfoTech stands apart in the exceedingly competitive software testing industry. As sr. director of engagement, Rajini Padmanaban leads engagement and relationship management for some of QA InfoTech's largest and most strategic accounts. She has more than 12 years of professional experience, primarily in the software quality assurance space. Rajini actively advocates software quality assurance through evangelistic activities including blogging on test trends, technologies and best practices, providing insights on software testing to analyst firms such as Gartner, IDC. She is also an active speaker in the Star conferences run by SQE.